Gallagher and Hertig have collected a range of seminal articles and papers that offer students insight into thinking by the makers of modern mission and world Christian studies. This is a priceless book for the classroom, bringing between two covers the most important reflections on these issues in our age. This marvelous book answers the prayers of teachers who have struggled for a generation with the problem of providing their students a resource that will offer an entre into the best thinking on the nature of mission and the emergence of world Christianity. - Publisher Ideal for study or reference, this volume collects classic essays from the past century on the most pressing questions in mission studies. 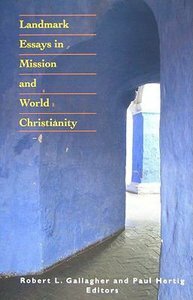 About "Landmark Essays in Mission and World Christianity"
Ideal for study or reference, this volume collects classic essays from the past century on the most pressing questions in mission studies.